Most Marvel fans know that Avengers: Infinity War is deep into production with shooting continuing throughout this weekend and into the summer. What has flown a little further under the radar is the fact that Black Panther is being shot simultaneously, utilizing some of the same characters and locations. Today, star Chadwick Boseman, who stars as title character T'Challa, shared a new video from the set. This arrives just as Danai Gurira's departure has been announced. The set video is pretty funny. It shows off how Boseman has arrived on set every day for the past couple of weeks. And it offers a look at co-star Martin Freeman's talent at playing the drums. Says Boseman about the behind-the-scenes teaser he shared with fans around the world on his Twitter. "How I arrive to set every day. Thanks to @auragin & DJ Juda, and who knew Martin Freeman could play drums?!" Chadwick Boseman was introduced as Black Panther in last year's Captain America: Civil War. And with minimal screen time, he proved a worthy member of the Avengers and this superhero universe. The character of T'Challa was brought to life with a certain kind of perfection that Marvel has become known for. Now the standalone movie is underway, shooting both in Atlanta and in various international locations. This new video offers a peek at just a few of the hijacks happening on set, and falls in line with other behind-the-scenes videos we've seen coming from the MCU. Martin Freeman and Chadwick Boseman are just a few of the impressive names showing up in the Black Panther cast. Also appearing on screen will be Sterling K. Brown, Forest Whitaker, Angela Bassett, Michael B. Jordan, Lupita Nyong'o, and Danai Gurira. The later of which has officially left the set in preparation for her return as Michonne in The Walking Dead Season 8. Here's what the fan-favorite actress had to say about departing Black Panther. "Just wrapped @theblackpanther yesterday. Love these wonderful people I got to share this journey with. #Wakandaforever!" Danai Gurira is playing one of the lead members of the Dora Milaje. This all-female group of warriors is tasked with protecting T'Challa as he inherits the throne of Wakanda. And with that comes a lot of changes for the royal guard. At this point in the game, few story details have been released for The Black Panther. We do know the movie will have an epic car chase that will be bigger, badder and more thrilling than the chase that introduced the character in Civil War. We also know that Gurira's character is Okoye, and she is the defacto leader of the Dora Milaje. Black Panther has been shooting since late January, and it is expected that things will wrap up completely in the weeks ahead. But while production on this movie is coming to a close, Chadwick Boseman will be skipping over to the lot next door to shoot his scenes for Infinity War, a shoot that includes two back-to-back Avengers sequels that will continue through most of this year. 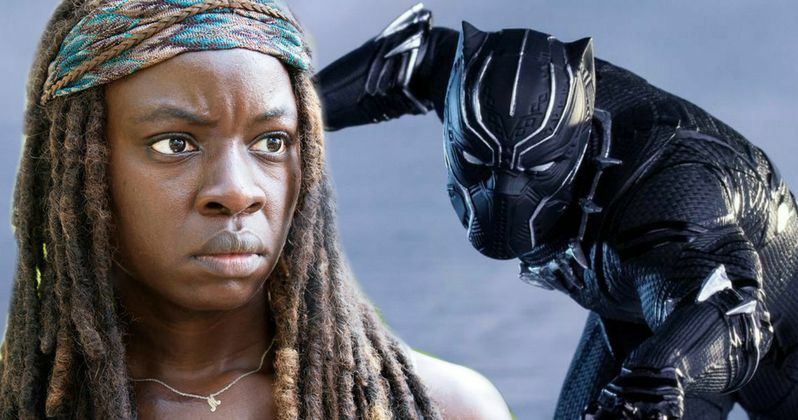 Martin Freeman is also expected to be back for Infinity War, but unless Gurira already shot her scenes for the epic ensemble, it's unlikely that she'll return before Black Panther 2 gets underway as part of Marvel Phase 4.